There are many opportunities to make money on surveys online, but unfortunately not all sites are legit. 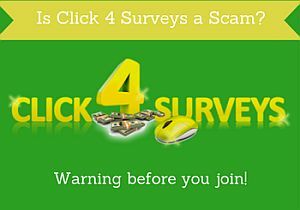 I am guessing you are here on this page because you have heard of Click 4 Surveys and are wondering “is Click 4 Surveys a scam, or can I actually make a good income on this site?”. I have done thousands of surveys over the past couple of years, and know how to recognize the good survey sites from the bad. In this Click 4 Surveys review, I will tell you all about what the site has to offer, and give you some warnings you should consider before deciding whether you want to join or not. What does Click 4 Surveys offer? When you first come to Click4surveys’ website, it looks very interesting. You can right away see a lot of promises about how you can make a lot of money easily by doing paid surveys. At the top of the website, there is a presentation video where the supposed owner will tell you what you can get out of joining and several supposed members will share their experiences. From the video and from the information on the website in general, you can see that the idea of the website is that you will join and then get access to a long list of paid surveys. There are hundreds available every day, and it is completely up to you have many you want to do, and thereby how much you want to make. From the video it also becomes clear that the reason you can get this many high paid surveys, is because click 4 surveys have inside connections to the biggest companies, and therefore they will be able to provide you a unique list of surveys that you will not be able to find anywhere else. That is what the site claims anyway, but before rushing off to sign up for the page, please continue reading so you have the full picture before joining. The members in the presentation video and the testimonials on the site make it very clear that you supposedly are able to make a full-time income through this site. The owner in the video also directly says that he is making a real income by doing this, and that you can easily make $500-$3500 a month from doing surveys. Once you have made money, you can get paid through PayPal or check. All this is what is presented as a great opportunity on Click 4 Surveys. But let’s now have a look at what the site really is about, and why you should be careful about joining. Let’s start with the presentation video and talk a bit about the signs in that you should be aware of, and what tricks that are used in the video to make it sound like a really great opportunity for you. The video is at the top of the page. When it starts, the first thing you will see is a woman saying “thank you, thank, thank you so much for this opportunity”. That in itself is not as such weird, but if you look at how she and the rest of the so-called members in the video acts, there are clearly exaggerating and or all about trying to create hype. I have seen and tested a lot of online money making programs, and I know that it is unfortunately easy to just buy testimonials for products, and this is unfortunately something many programs use. Some programs also just take random images online and say it is a user review. From how the Click4Surveys testimonials are, I right away was aware that it seemed to exaggerated, and I suspected people had been paid to participate and give these testimonials. But I decided to do some more research. Let me give you a few examples. First example is one of the images used on the side as a testimonial. One of the positive reviews on Click 4 Surveys’ website. I researched this image, and it is found and this exact image is found on several stock photo platforms. The same image is found on several stock photo platforms. 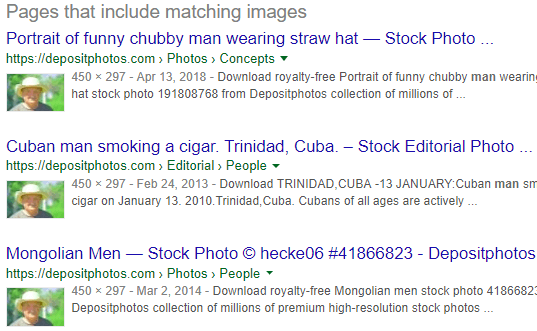 So it seems the image is just take from a stock photo service to have a picture for a user. In addition to this, Click 4 Surveys is actually itself admitting it has paid the people giving testimonials in the video. If you scroll all the way to the bottom of the website, you will find a disclaimer in the footer. If you click this, you will see the following. The disclaimer reveals the people giving video testimonials have been paid. Click 4 Surveys is saying in the disclaimer that the people giving testimonials in the video have been paid to give them. So it seems you should not really trust any of the positive Click 4 Survey reviews you see on the website. Instead ask yourself – if it really was such a great service, would it then not be possible to get some real user reviews without paying them? After some great testimonials in the video, the owner Daniel Cooper come on the screen to welcome you – not only to the website but as he say “welcome to our family”. And then he explains how it is a community of like-minded people that have figured out how to make a living from wherever they are and having more time to enjoy life. And all this is possible because of Click 4 Surveys and the inside connections they have that you can find no where else. The “owner” of Click 4 Surveys welcoming you in the video. This is clearly an attempt to try to build trust, and by calling it a family, we automatically think that it is more trustworthy, because most often we trust our family more. And the stories told by the “members” are some most of us can relate to about how to have more time with our family, not having to worry about money, getting out of debt etc. Another trick used to create trust is that Daniel Cooper mentions some of the big companies that spend billions of dollars on market research and that click 4 surveys are working with. Here he mentions some big trusted names like Coca Cola, E-bay, Walmart, and Nike. It is definitely true that these companies are spending a lot of money on market research, but they are definitely not having a close cooperation with Daniel Cooper – in fact there is no evidence on the site that is his real name or the real owner. Maybe he is also just paid to be in the video? But it is a clever way to use some trusted brands to try to create trust for your own brand. But also not very ethical and very manipulating. In connection to the earning potentials, Mr. Cooper also talks about how you can afford whatever you like, if you join. And at the same time there is a picture of a boat. 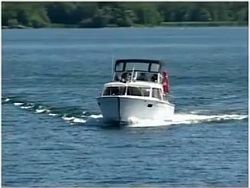 This image of a boat in connection to making money is often used at sites that are no so legit. Apparently, the idea of getting a boat is for many of us a symbol of ultimate freedom and being able to effort whatever we want. So at first sight, the presentation video can look very tempting, and it is the first thing you meet at the page. But be aware that it is full of small manipulating mind tricks that are planned very cleverly to go into you subconscious and affect you before you continue reading what they have to offer. It is simply meant to sell you a dream of the life you want. The video is however not the only warning sign, and we will now look more at some more of these warning signs, and signs that click 4 surveys is a site you should be very careful about joining. Yes, it costs money to join Click 4 Surveys. This is a clear sign that a survey site is not worth joining. All the legit sites are free to join. Not only does it cost money to join, but this information is also hidden at first. It is not until you have read all the information and decided you want to join and put in your email to join, that you will be able to see that it costs money. It is such a dirty trick to not be upfront with the cost, and if it was something worth paying for, there would be nothing wrong in telling it up-front. Instead, you have to put in your email before you find out. This is clever from their side, as that means that they now have your email address so they can start sending you follow-up emails, in case you do not join right away. And they will do this – you will start receiving emails with reminders, great stories about how it can change your life to join, and special offers to try to convince you to join. I have even received an email from them promising me an “extraordinary” free gift if I join. The free gift would be a money making system that would be able to generate me huge amounts of money on autopilot without ever doing anything – yeah right! Unfortunately such a system does not exist, and it is just an attempt to lure you into signing up. It is clear that the site is trying to sell you the idea that you can make a real income from doing surveys, and become financially independent. This is NOT true. You can make some nice extra money on the side, if you join the legit survey sites, but you will not be able to do it for a living. Not even if you joined all the legit sites there are. Any survey site that claim you can become rich from their site, is a oage you have to be careful about joining. They might just try to become rich by selling people a dream that is not true. You cannot find any information about who is behind the site. Well, you can see “Daniel Cooper” in the video and his name mentioned. But other than that, there is no real information about the company, when it started, who is behind it, etc. That is a warning sign when it comes to any website that tells you, you can make money through them. Click 4 Surveys does however have a support you can send a message to. This is unusual for a site like this, but does not really prove anything other than it is a clever site in the way it tries to create trust, and the support is another way where they can then try to sell you their membership. There are both in the video and other places on the website pictures of checks to prove that you can actually make money. But if you look at the check it looks funny – have you ever seen a check where the number is written with this big letters (see picture)? It is just another trick to make some fake proof to get you to join. On the site there is a sample survey so you can get a taste of how easy it is to make money this way. It consists of 11 very easy and short multiple choice questions. It will probably take you around 1-2 minutes to do. You will not get paid for this sample survey, but it is there to give you an idea about what to expect. But do not expect this kind of survey to really exist. It says that usually you would get $15 for a survey like this. Anybody that has ever done any online surveys know that this is completely unrealistic to earn $15 for just 1 minute. But a clever way to make it seem like a way to make easy money. Once you have entered your email, you will see the price. The usual price is $97, but you can get a special discount so you price will “only” be $34. The “special offer” you will get, if you try to leave the site before joining. Even though you can then join for $19, it is still not something I would recommend, even though it is claimed that there is a money back guarantee. There is a guarantee – so what is there to lose? Yes, Click 4 Surveys offers a money back guarantee, and then you are probably thinking what there is to lose. Well, you might be able to get the money back. But it might take a lot of effort. And also they know that most people are convinced by a money back guarantee, but then cannot be bothered to make an effort to get back $19. So if they use the guarantee to convince people to join, and enough people do, but cannot be bothered to go through the hassle to get them back, it still ends up making them a lot of money. There might be a money back guarantee, but that it is a survey site trying to charge for a membership is in itself the biggest warning site you can get, to stay away from a site. Is it then not possible to make money on Click 4 Surveys? You will get access to a list of survey sites you can join, where you can make some money. But not something worth paying for getting a list like that as you can find it many places for free, and you will for sure not be able to make the amounts that are claimed on Click 4 Surveys. There is however a way to make better money on Click 4 Surveys, if you are an unethical person that does not mind cheating other people to make a bit of cash yourself (and I am sure you are not). They have an affiliate program, where you can get a commission, if you invite other people to join the site and they end up joining. You will then get 70% of the membership fee from the person joining. Not a route I will recommend. If you are interested in making a real income online it is definitely possible, but it takes some hard work and dedication. But if this is what you are aiming for, you can check out the link below for more information. Final verdict – legit or scam? If you have made it so far in this review, I think it is pretty clear by now that Click 4 Survey is not a site I recommend. But let’s sum up the pros and cons so you can see why this is. In general, you can assume that any survey site that charges a fee for you to join, is not worth joining. Other than that, there are a number of other signs that this website is not worth joining, as you can see above. Yes, you might get access to a small list of survey sites, but this is not something you should pay for. And it will not be surveys that can make the kind of money you are promised. For these reasons, Click 4 Surveys is clearly a site I recommend staying away from. But if you want to make money from surveys, that is definitely possible, but then there are many sites that are much better – and free. Are there any legit survey sites? Luckily not all survey sites are scams, and there are plenty of legit and free survey sites. Below you can find a link to the the best survey sites in your country. Just remember that paid surveys can be a nice way to make some extra cash, but it will not make you rich. If you have any questions, comments or have any experience with Click 4 Surveys yourself, I would love to hear from you in a comment below. Click 4 Surveys is charging a fee for you to join. That is the first sign that it is a survey site to stay away from. Other than that, it is making unrealistic claims about the earnings potentials, using a fake sample survey to convince you to sign up and is in general making exaggerated claims. The only reason Click 4 Surveys is even getting 1 star is that it is the minimum that can be given. It does actually not deserve any stars at all, and if you are looking to make money from surveys, I would advice you to join for other sites instead. I thought I would get some few dollars off this system bit once I heard the claims of getting super rich and the fact that you have to pay to be part of it made me run fast away from it. I was hoping you can help me get a good data survey program that pays well and doesn’t require me to pay to work for them. To me, that is bribery. God to hear you decided not to join Click4surveys. You can check out my top 10 list of the best paying surveys in the top menu. Which ones are the best for you depends where you live, but you can also see that on the list. But all the ones on that list are legit and free. None of the legit survey sites will ever charge you to join. Hi Mikael! I am actually looking for means of earning money online and I have actually heard of this click 4 surveys before! I was very hesitant on signing up and luckily I did not after reading your review! Anyways, I liked how you wrote the review as it was comprehensive yet easy to understand! Regarding, paid from surveys program, what is your best recommendation? Glad to hear you did not sign up for Click 4 Surveys. Regarding the best survey sites, it depends which country you live in. But you can check out my top 10 list and get a good overview of the best sites, and also see where they are available.